Bengali food, for me, always evokes images of fragrant fish curry with spicy sauce served over hot bed of basmati rice. Bengali food encompasses the food of historical Bengal, now divided into country Bangladesh and state of West Bengal in India. Bengal is full of rivers and consequently most of Bengali fish are fresh water fish. Until recently, marine fish were considered somewhat inferior. Floodplains of Bengal have been growing rice for more than four millennia. According to a decade old World Bank estimate, an average Bangladeshi gets 70% of calories from rice. Indeed there’s a saying that goes as “machhe bhate bengali”, which roughly translates into “a Bengali is made of fish and rice”. There is no standard way of cooking Bengali fish. There are thousands of ways to cook a fish in Bengal and millions of families have their own unwritten family recipes. One of the famous ways to cook method is called “jhol”, which translates to liquid, and conceptually a curried stew with vegetable. Fish is simmered slowly with herbs and vegetables so that flavor permeates – something like French bouillabaisse. My take on a simple Bengali fish curry included a neutral flavor fish, such as tilapia cooked with Panch Phoron spice in onion and tomato stew – a tribute to Bengali machhe (fish) jhol. I understand that most people don’t have Panch Phoron in their cabinets. Even most Indian cooks might not have it. Few years ago, I saw my friends Sr’na and Pr’nta cooking with it. They were shocked that, being a self-proclaimed Indian food connoisseur, I didn’t know about Panch Phoron. My ego was hurt but balanced was restored when some of good Indian cooks also didn’t know about it. Then, I realized it’s a regional spice. Panch Phoran is a spice blend made from five (panch) whole spices; fenugreek, nigella seeds, mustard seeds, fennel seeds, and celery seeds or cumin seeds. It’s easily found in any of your local Indian grocery store. Even if you don’t have it, for purpose of this Bengali jhol dish, you can make your own with three, instead of five, main ingredients; fennel seeds, cumin seeds, and mustard seeds. Remember the keyword here, use “whole seed” not “ground spice”. My Bengali fish recipe is so simple that it can be written in just one sentence. Heat oil on medium heat, fry spices for few seconds, sauté sliced onion till golden brown, and add chopped tomatoes, add salt, bring stew to boil, add cut fish (tilapia), turn off heat after a minute, and serve after few minutes of simmering. 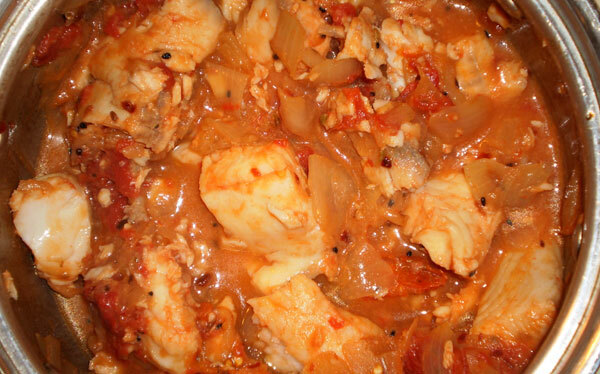 Try to add at least same amount (not more than twice) of veggies (including onion and tomatoes) as the fish. To get started, limit ½ tablespoon of spice mix per realistic serving of the dish. Remember that you can always add spices later but it’s impossible to remove it. Optionally, you can also sauté a few cloves of garlic and shreds of ginger with onion. One other thing you must remember is not to overcook the fish. 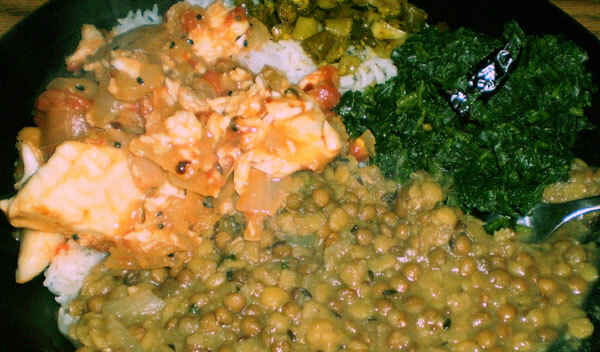 This is not a typical highly spicy creamy heavy dish served in Indian restaurants. The aromatic sweet flavors of fennel seeds, curry flavor of cumin seeds and mild spicy/hot flavor of mustard seeds go well naturally with tilapia and onion/tomatoes to make a very pleasant and light dish. 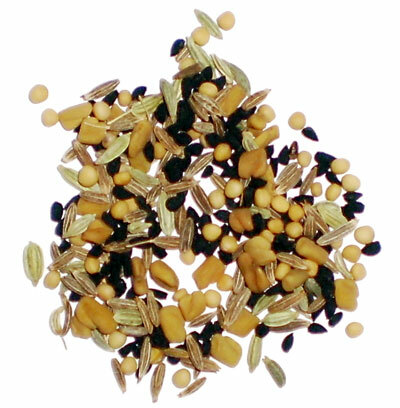 Panch Phoron’s image is from food-india.com.